Australia last night shocked the cricket world by inflicting India’s first home ODI series loss since 2015 thanks to a sublime Usman Khawaja century and a disciplined bowling effort. Australia incredibly rebounded from 0-2 down in the series to win their next three matches against India, who long have been dominant in home ODIs, losing only two of the previous 20 series they had hosted. The Aussies just one week ago were in arguably their deepest-ever ODI form trough, having won just three of their previous 20 matches, and not having claimed an ODI series for more than two years. It has been a jaw-dropping turnaround engineered by Khawaja, pace spearhead Pat Cummins, batsman Peter Handscomb and leg spinner Adam Zampa. Those four players were again key last night as Australia batted first and made an above-par score of 9-272 on a tricky Delhi pitch before defending that total impressively. Cummins took 2-38 to finish with 14 wickets at 15 for the series, in what was the standout performance of his ODI career to date. Zampa, meanwhile, reignited his flagging ODI career by not just picking up 11 wickets at 25 for the series but also consistently taking big wickets. Last night he snared 3-46 and all but killed off the match by grabbing three wickets in as many overs just as India were beginning to threaten. Earlier, Khawaja scored an imperious ton, capping a phenomenal series for the 32-year-old, who churned out 383 runs at 77, including scores of 104, 91 and 100 in their three victories. The left hander timed the ball wonderfully well from the first over last night, with his assertive start forcing India’s bowlers to make a series of strategic alterations. Then when spin came into play he went after that too, lofting Kuldeep for a six over long on in his first over. At the other end Aaron Finch played a sedate knock of 27 from 43 balls during which he again struggled for timing and placement. He was lucky to survive that long after playing and missing to his first ball and then almost chopping on second ball. Eventually he was undone by a lovely piece of flight from left arm spinner Ravi Jadeja, who castled him with a delivery that gripped. That brought to the crease the in-form Peter Handscomb, promoted to number three due to the axing of Shaun Marsh. Handscomb was his usual busy self, piercing the gaps expertly and running well to ensure Khawaja was not placed under any pressure to up the ante. Once more Handscomb played India’s star spinners brilliantly as he cruised to 52 from 60 balls before falling victim to the vagaries of a difficult pitch, caught behind off a Mohammed Shami delivery that exploded. Replays showed that the previous delivery from Shami on that very same length had bounced almost 50cm lower, highlighting the major natural variation on offer. With Khawaja (100) and Glenn Maxwell (0) having fallen just before Handscomb, Australia had suddenly suffered a collapse of 3-7. What looked like a potential 320-plus score became a far more modest one. Australia only managed to pass 250 thanks to an industrious late stand from quicks Jhye Richardson (29 from 21 balls) and Pat Cummins (15 from nine balls). While Khawaja was Australia’s topscorer for the series, Handscomb was also fantastic, with 236 runs at 47. 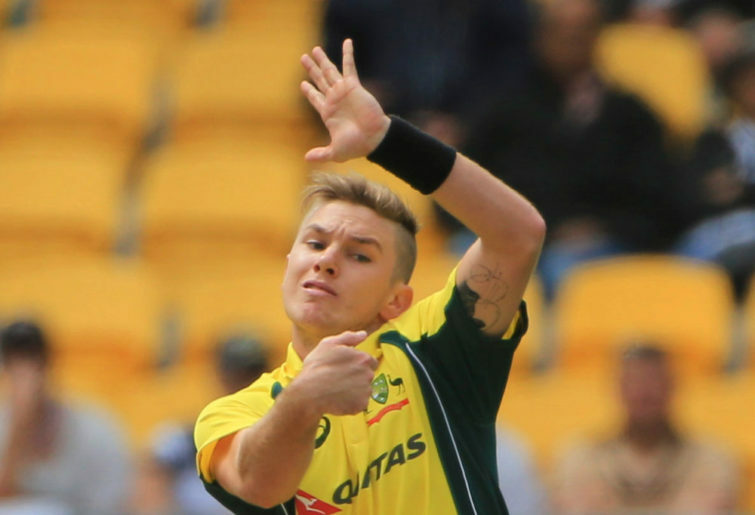 Leading into this series, none of Khawaja, Handscomb, Cummins or Zampa were cemented in the ODI side. Now this quartet have led Australia to the most unlikely of series wins, their first such ODI victory in India for almost a decade. Ronan has been a reporter for 15 years and now travels the world as a photojournalist, contributing words and photography to more than 70 magazines and newspapers across the US, Europe, Asia, Middle East, Canada and Australia. He contributes to the likes of CNN, BBC, The San Francisco Chronicle, Toronto Star, The Independent (UK), The Guardian, Irish Examiner, Australian Financial Review, South China Morning Post, Singapore Straits Times and many magazines. Before becoming a freelance photojournalist he spent nine years working at daily newspapers in WA where he variously was a chief crime reporter, political writer, health reporter, features writer and sports reporter.